Voted the world’s most handsome Man Alive twice, Brad Pitt is definitely a force to reckon with when it comes to men’s style. He’s always looking dapper in what he wears, and his hairstyle is always changing, each diverse look as good as the last. Of course, his naturally good looks that have made him admirable by both women and men the world over makes sure that whatever hairstyle he wears looks great on him. Over the years, he has rocked quite a number of haircuts and we’ll look at the best of them below. Let’s start on the shorter side. Brad Pitt rocked a buzz cut for the movie Mr & Mrs Smith. Closely cropped, the haircut drew attention to all his prominent facial features. Most people would not look as good if they pulled a drastic long to short haircut change, but Pitt looked just as gorgeous in his buzz cut. This is a style that does not require a lot of maintenance besides frequent visits to the barber to keep it short if it grows fast. When he’s not keeping his hair nearly non-existent with a buzz cut, Pitt also likes having his hair all long. He has been spotted with long hair a lot of times, which he holds at the back of his neck in a ponytail. That’s a great style to keep stray hairs in place and from fluttering into the face every now and then. The slicked back look always looks good on Pitt, giving him an edgy yet professional look that’s not boring at all. It’s a haircut that looks stylish on men of all ages, and never grows out of trend or gets any less classy. 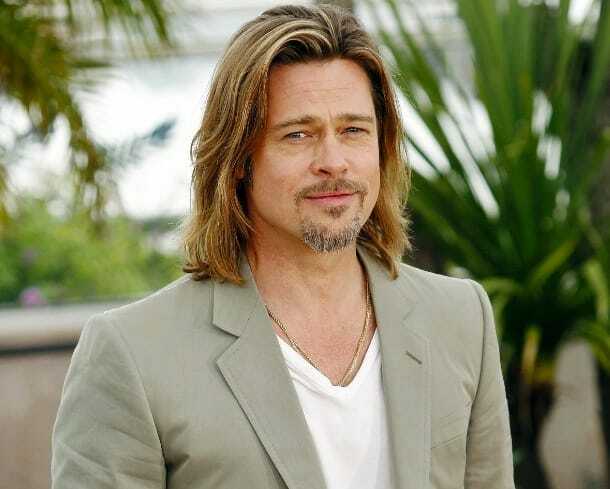 Brad Pitt’s slicked back look is a combination of medium length hair at the top that has been slicked back with hair products, with the sides shaven clean. It’s a style that has always remained elegant. Pitt has sported every haircut you can think of, including short and spiky. Playful, fun and doing total justice to his looks at the same time. It’s a look that can sit on both sides of the fence when it comes to professional and casual, so it’s never wrong. It’s a stylish haircut that doesn’t require much maintenance. Other times Pitt just grows out his blonde hair and doesn’t bother holding it back. He has on occasion let his thick hair grow to his shoulders and this did marvellous things for his looks. As hard as maintaining long haircuts is, it’s all totally worth it. Pitt looks good in his natural blonde locks, but even better when he has it bleached. It’s the ultimate attention grabbing hairstyle, not that he needs any more of that. Pitt sampled the platinum look all the way from a buzz cut to shoulder length and nailed it all the way. This is a hairstyle that requires a lot of maintenance to keep the hair healthy and from product damage.